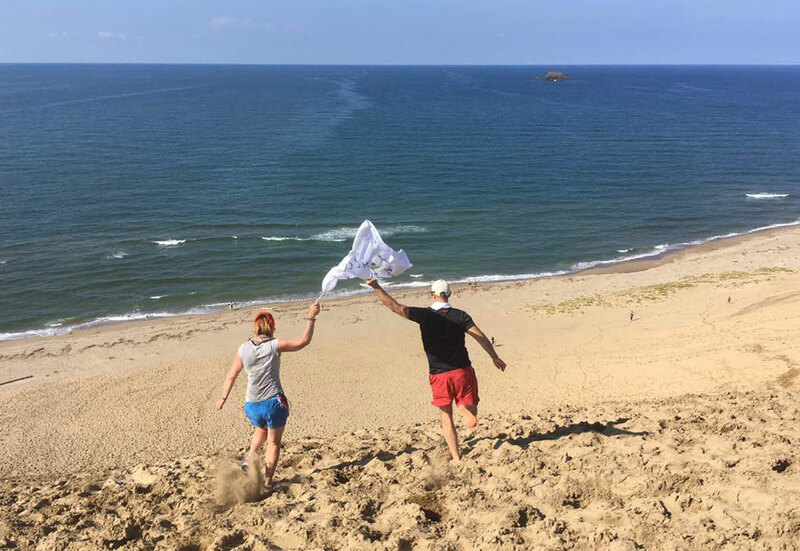 Follow our expedition as we travel through the Tottori region of Japan, exploring trails hosting an international conversation on trails and why they matter to the next generation of trail visionaries. Our 15 Trail Visionaries came together for the first time today arriving from 13 different countries, to meet at the airport in Tottori before heading to the start point of the trip. The adventure began with us all learning to count in Japanese to keep track of our team as we headed off in a bus to a traditional coastal inn on Sanin Kaigan National Park coastline and the small hamlet of Iwami. We were joined by NPO Mirai Director and Tottori Prefecture government representatives. The formalities started with introductions and briefings. 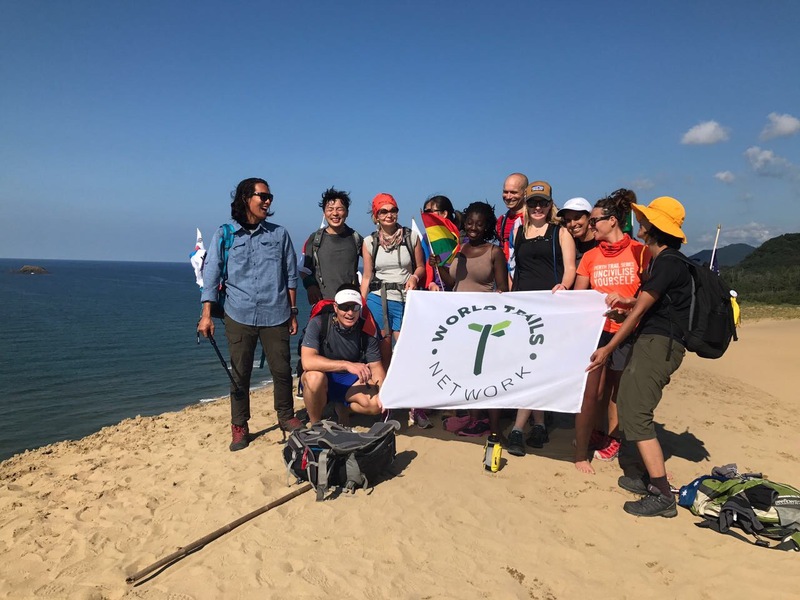 Each participant and Tottori representative had a moment to express where they come from, what trail business they work on, why they’re on the expedition and what motivated them to be part of this expedition. We were treated to an amazing traditional Japanese meal and it was clear form the start this expedition was going to be fun. A send off gift from the World Trails Network included a unique trails notebook for each team member together with a limited edition bandana and beaded trails band. “ I recalled a gripping sense of purpose present in the room. A high level of focus, kindness, laughter and community surrounded our beginning.” – Zak Klein. It was invigorating to finally meet face to face with each other as a team after weeks of contact only via conference call in preparing for the expedition. Members of the expedition from 13 different countries: Switzerland, South Korea, Chile, Russia, South Africa, Japan, USA, South Korea, Brazil, China, Greece and Taiwan. 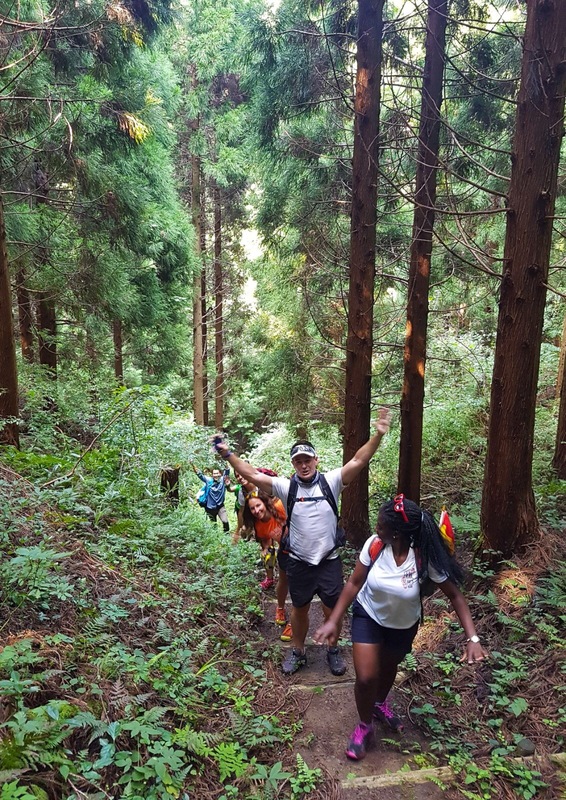 Enthusiasm all round – the team on the Ueshi Castle Trail, beautiful forests and views. Team engaging and having fun. You could feel the energy at breakfast this morning as we planned our first day of trail activities. Breakfast and a few more formalities out of the way and we were off – backpacks on! Conversations sprang up between us on our 4km hike to our kayaks at Shirawara beach. Along the way we passed through an old fishing village with traditional Japanese houses. The views as we walked were completely unexpected and not the type of coastal scenery one immediately associates with Japan. The kayak trail we followed hugged the incredibly beautiful rocky coast as we paddled between islands, parallel to beaches and through caves and the weather was just perfect. The famous coastline of San’InKaigan highlighted the value of easily accessible tourism trails that are well planned and managed. We took the kayaks out at Iwado port and celebrated the long paddle with a Vietnamese lunch in a super little restaurant over-looking the bay and the stretch of beach that was to be our trail for the afternoon. 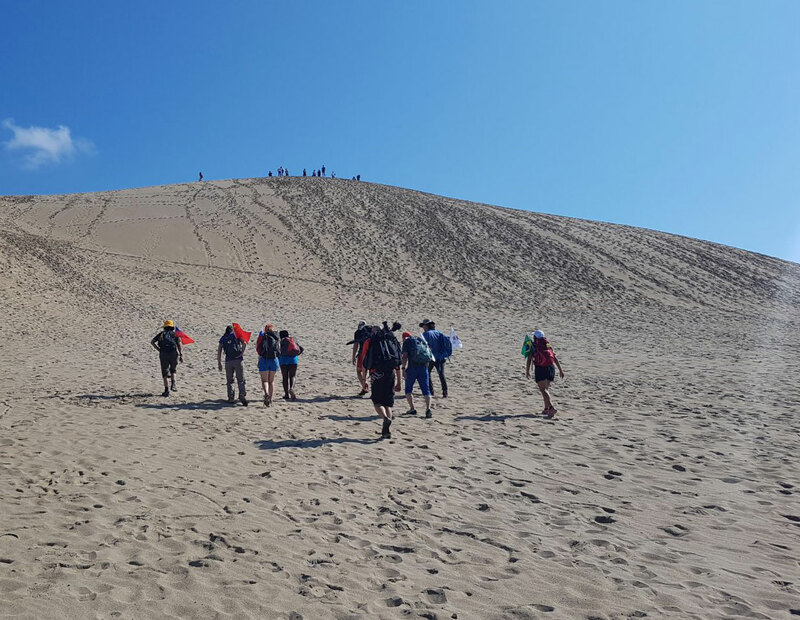 Our 7km beach walk ended at the famous Tottori Dunes, the biggest dunes in Japan. Rolling or running down from the highest dune into the ocean brought the kid in all of us. We played in the sand and took in the beautiful views of the coast line as we looked back on the distance we had paddled that morning. Our stroll across the dunes towards late afternoon took us into Yanagijaya camp site. That evening at camp, we broke into teams, set tasks for each group and put an agenda together for what we planned to achieve in the days to follow – after all this is an educational and focus driven expedition. Our first night of camping meant getting familiar with the tents, and the camp set up. We established 4 working groups for: 1. Social Media, 2. Camp, Food, 3. Timing and Navigation 4. Summary, Thought Leaders, and Note Taking.Without showers available at the camp, some of the team visited a nearby inn for a traditional Japanese bath, others were more inventive and created a shower with a hose through the window of the men’s toilets. A full moon night with Pizza and beer made for a bonding experience as we shared our highlights and low points of the day.Documentary film maker Tom Malecha conducted interviews with team members at the end of the day and would do so for the rest of the expedition. The beautiful coastline on our way to kayak trail and our first group shot. Running down the dunes into the ocean. Leaving the dunes after a morning run and breaking camp, we headed to Cafe Ippo on lake Togo where we met a few students from Tottori interested in trails as we explored in a brief presentation and discussion the value of quality trail assessment and monitoring, within the framework of a clear trail planning model. An insightful dialogue was continued on the trail that followed. 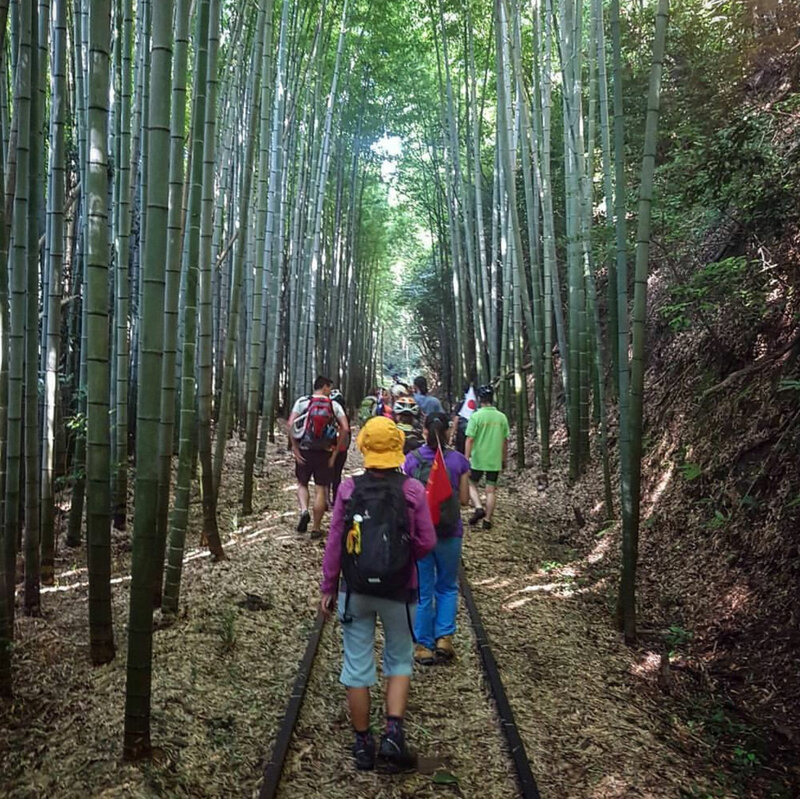 We then took our conversation to the Chugoku Trail itself and completed the seldom used trail winding through rich forest and along beautiful ridge lines to Ueshi Castle. Here we were able to have a debrief of our insights relating to the trail and give feedback to Tottori Government staff as to how the trail can be revitalized and improved to become of use again to visitors, tourists and locals alike. “A trail that is not used, is a useless trail”, was one of the quotes from the workshop presentation. The conversation hinged then on how to revitalize heritage trails and reignite a new generation of trail users. Our team offered valuable trail insights and feedback to the Tottori government representatives who joined us for the day. We look forward to this trail becoming popular again and a hosting local trail champions of Tottori. Once off the trail we transferred to the Yamamori Onsen Campsite outside Sekigane. Revitalizing abandoned rail trails, cycling up ridiculous steep hills, dodging spiders and admiring the most stunning scenery and farmlands within the valley. We spent a lot of time today discussing the World Trails Manifesto we are working on as next generation trail advocates. Our cycle day started off with NPO Mirai support team joining us. We headed off to a converted rail trail that runs through a small bamboo grove. After exploring it briefly we headed on for our longer ride towards Kotoura. Meandering through small country backroads brought us to an abandoned bridge and the perfect site for drone video of out team spelling the word T.R.A.I.L.S. Wasps soon put an end to the excitement as a number of team members got stung. But the final video footage was worth it and was posted to social media. A steep climb out of the valley brought us to the top of the pass that would take us into Ikkodaira Campsite. Having arrived by lunch time we were able to set aside a good portion of time to further explore the content for a Next Generation Trails Manifesto. The team broke up into groups and the discussions were both insightful and fun. By evening we were gathered around the fire with singing and conversation taking us into the night. 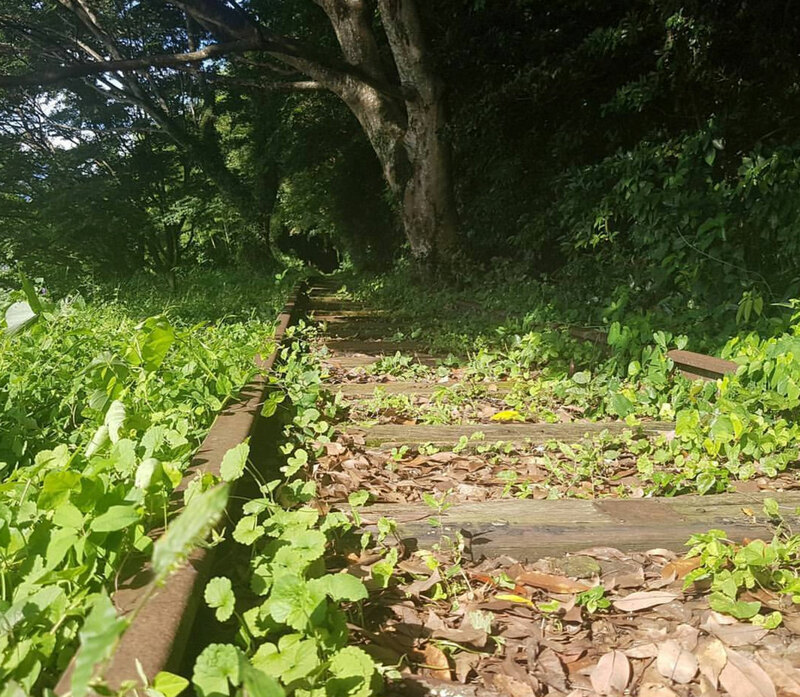 Magical bamboo growing through old rails. The weather turned for the worse today but it only dampened our clothes and not the experience. 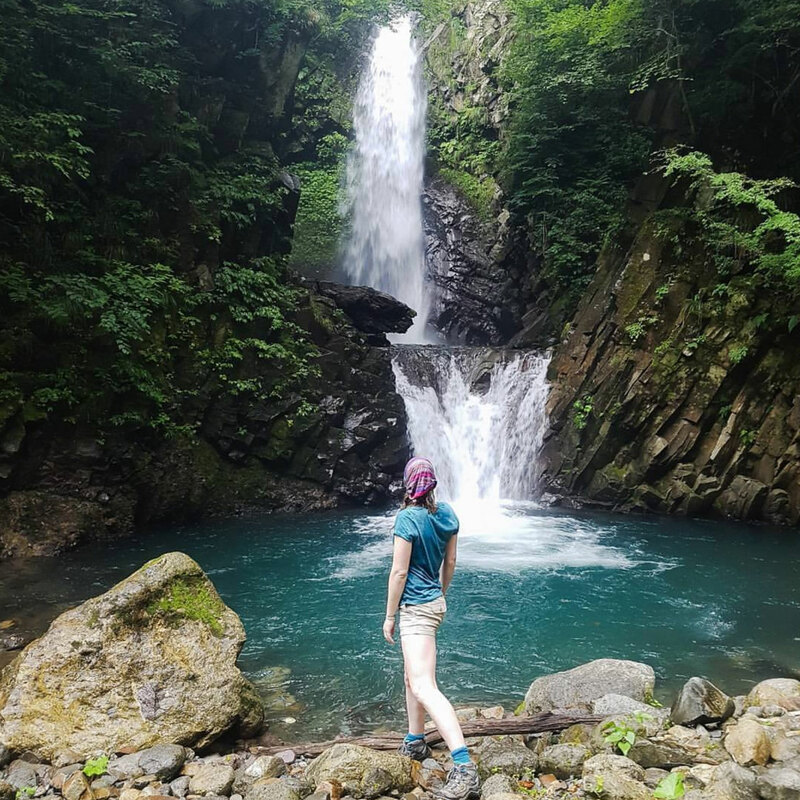 By far the Daisen Waterfall was the highlight of the day and illustrated how well designed trails include natural features that become draw-cards for visitors and trail users.Skin tingling and refreshing. The trails around the base of Mt Daisen are breathtaking. The vegetation changes and the stonework on the trail were only some of the highlights. The colours were so vibrant. 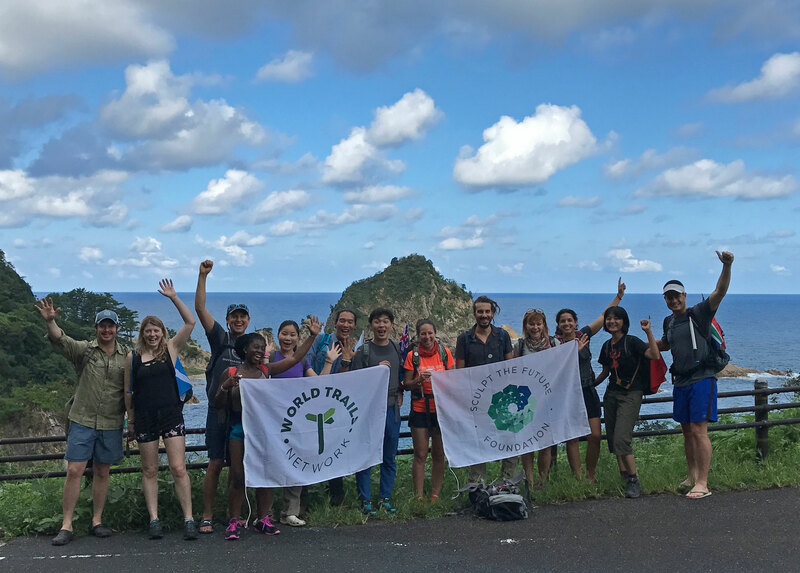 Walking through the Kotoura reserve and the Kawadoko Trail with its forest and waterfall highlights afforded us the opportunity for many more conversations about trails and identifying the challenges they pose from a maintenance and care perspective. We also explored why trails are so important to conservation and at addressing nature deficit disorder. We had the chance to see the interaction of wildlife on trail, tracking various small mammals that had left their tracks in mud. We saw lots of creatures today too, including a giant slug, a giant escalabor beetle, a friendly toad and lots of fresh prints from wild boar and small antelope – but no bears. By evening the threatening storm had arrived and we were camped under shelters at Goenzan Campsite. The storm grew in intensity with high winds. This did not stop us from having a well deserved wash at the local hot springs (Onsen). With rain continuing to threaten the day’s activity, we started off by completing a brief tour of the Mount Daisen Museum which offered valuable insight into the history and fauna and flora of Mount Daisen. As rain continued in the morning we hosted our feedback dialogue regarding the Trails Manifesto beneath a Buddhist bell. On conclusion we decided to give the summit of Mount Daisen a go and set off to climb it in the rain. The rain came and went throughout the afternoon, but we made it to the summit in good spirits. Our day ended with some shopping at the local Mont Bell store before an excellent dinner and further adventures in the Onsen. A beautiful morning greeted us after all the rain. 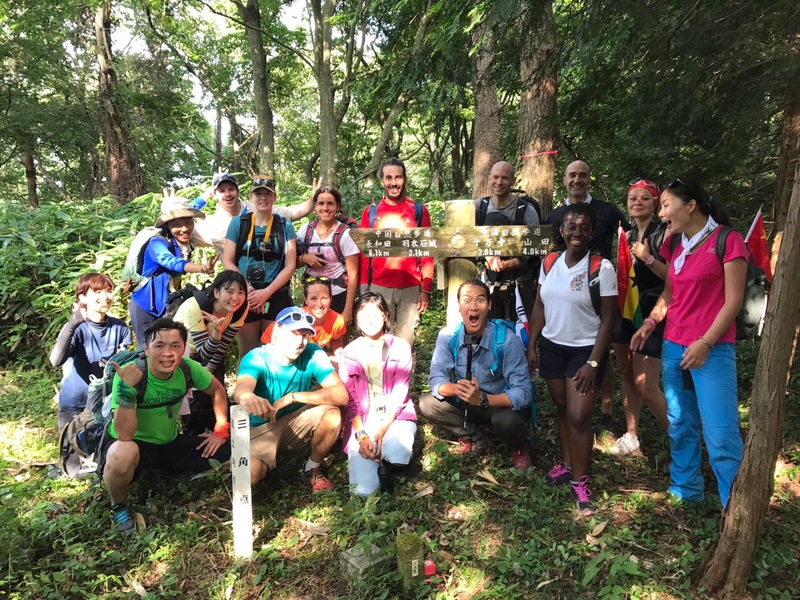 We caught our morning transfer to Misasa and Mount Mitoku, where we headed up an ancient trail, climbing and scrambling up tree roots and passing many ancient tress and cultural sites. Again we found ourselves beneath a bell – this time suspended high on a ridge-line amongst trees, with incredible views all around. The trail was steeped in history and sacred relics. On returning to the main temple, we enjoyed a Buddhist vegetarian lunch. Our post lunch activity included reading out our individual trail commitments and hopes and being interviewed for a last time for the documentary. By early evening we were settled in our hotel for the night and ready for the last evenings celebration. This included a banquet of traditional Japanese food, speeches and thanks giving with exchanges of gifts. After dinner the team did some souvenir shopping and also took to the local Onsen (hot springs) beside the Mitoku river. This was a unique trails adventure and “on-trail conference” of next generation leaders in the international trails sector. Bringing together a remarkable, small, yet focused team of dedicated trail advocates. Off a small investment we were able to leverage further funds and convene a powerful meeting of motivated and trail champions from 13 different countries. It was a unique and life enriching experience for everyone on the team, including our hosts. Knowing that there are other people in diverse parts of the world facing the same or similar challenges as oneself is reassuring and supportive. Together e can do more and do better. The potential for further international cooperation between participants in assured. The Chair and Advisory Committee of the World Trails Network wishes to thank all support teams, donors, participants, the organizing team and the Tottori Government, NPO Mirai Foundation and Sculpt the Future Foundation for making this event possible and as such supporting the development and maintenance of sustainable trails today and into the future by exposing this next generation of trail leaders to the global challenges trails face and the opportunities they present. A special expression of thanks goes to our Japanese organizing team at NPO Mirai, Mr Kishida and especially to Mr Norimasa Yanagawa who was instrumental in defining the itinerary and expedition route, his knowledge of the trails available in Tottori and his willingness to work under immense time pressure to make this event possible was much appreciated. Additional thanks go to the expert logistic support that Kiyomi Ikehara offered, her calm demeanor and smiling willingness to readily meet the needs of the team was appreciated by all as she made impossible requests happen without hesitation. Our interpreters as always played an important role and the professionalism and friendliness of Shery Megaly and Tomoko Kitaoka went a long way to ensure communications flowed with ease and understanding. A final thanks goes to all the participants who brought a sense of adventure to the team and who willingly shared their insights and passion for trails.